Eye-popping, vertigo-inducing paintings, plug-in artworks with moving parts—these were all the rage back in the 1960s. By David Ebony - Eye-popping, vertigo-inducing paintings, plug-in artworks with moving parts—these were all the rage back in the 1960s. At that time, illusionistic abstract works appeared on the walls of major museums and galleries around the world. The dizzying genre, however, abruptly fell from favor in the 1970s—almost in the way of the Hula Hoop craze—when some observers began to disparage the style as limited and gimmicky. There was a more serious and sober side to this art movement, however, that a new exhibition sets out to reclaim. “The Illusive Eye,” a thrilling show at El Museo del Barrio, has brought together a group of seminal Op art pieces and Kinetic sculptures from around the world that have not been shown in New York for decades. On view through May 21, the exhibition features paintings, objects, films and installations by 53 international artists made in the 1950s through the 1960s. Though its time in the limelight was brief, Op and Kinetic art’s appeal was vast and intense, and the current show demonstrates why. Organized by the museum’s recently appointed executive director, Jorge Daniel Veneciano, “The Illusive Eye” commemorates the 50th anniversary of “The Responsive Eye,” a 1965 exhibition that was one of the most sensational and popular museum exhibitions of Contemporary art in its day. “The Responsive Eye” was a blockbuster hit for the Museum of Modern Art, where it debuted. A crowd-pleasing spectacle, the exhibition was met by equally enthusiastic audiences across the country, making successful appearances in St. Louis, Seattle, Pasadena and Baltimore. “The Illusive Eye” contains works by many of the same artists as the MoMA show, including quintessential examples by Bridget Riley, Frank Stella, Carlos Cruz-Diez, Victor Vasarely, Richard Anuszkicwicz, and the Japanese artist known as Tadasky. Mr. Veneciano, however, has shifted the emphasis here to include more Latin American artists, which underscores the importance of the movement’s relationship to Concrete art and other forms of Latin American abstraction. He also added many more women artists. This curatorial approach contrasts with the MoMA show, which was rather more New York-Eurocentric, and male dominated. Indeed, among the highlights are some captivating pieces by women, such as the tondo Black and White II (1960) by Cuban-born New York painter Carmen Herrera, who, at age 100, will be the subject of an upcoming retrospective at the Whitney Museum of American Art. The rigorous geometric composition she shows here is an iconic work featuring hard-edge black-and-white semicircles, and a small half-black, half-white diamond shape at center that seems to pulsate as one approaches the canvas. Literally pulsating are the twisting and spinning pieces of shiny cut sheet metal in the gyrating mechanized sculptures by Argentine artist Martha Boto. 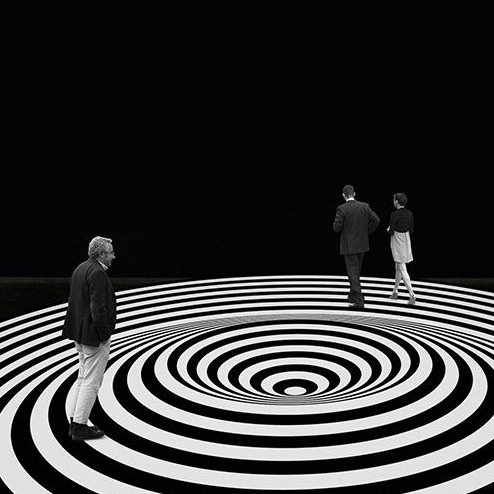 Elsewhere in the show, a darkened galley features a large floor painting of black-and-white spirals, Spazio Ad Attivazione Cinetica 6B (1966/2015) by Italian artist Marina Apollonio. Viewer beware: This piece can cause a real sense of vertigo. On a wall in the same room, a video projection by Argentine artist Ana Sacerdote shows a feverishly evolving panorama of colorful squares and rectangles. The images are actually stop-motion animated films of Ms. Sacerdote’s own paintings. Produced in the early 1960s, Ms. Sacerdote’s efforts anticipate by some years the use of video cameras by the avant-garde in documenting their works. Among the reasons why the works in “The Illusive Eye” seem fresh and exciting today is their obvious relevance to the digital age. Many of the pieces here have the look of computer graphics, and various high-tech imaging techniques. For instance, engaging the viewer in an almost theatrical way, the optically challenging combination of painting and sculpture that Jesús Rafael Soto offers in his well-known Kinetic wall reliefs seems related to virtual reality imaging. Tony Bechara’s labor-intensive painting 125 Colors (1979), showing countless small colorful squares packed onto the canvas surface, anticipates computer pixelation by a decade or more. And one can easily imagine that the large suspended wire sculpture by the Venezuelan artist Gego was created with the help of 3-D computer programs. Many of the artists included in the exhibition were fascinated by mathematical puzzles, and scientific and experiments in phenomena such as the parallax effect, in which objects appear to move in relation to things around them. Astronomers, for instance, use parallax principals in measuring the distances of stars, and, ultimately, the universe. But the aim of the show is not just to fool the eye and delight the senses. Organized into four thematic groupings—The Optical Sublime, Parallax Apparitions, Mandalas and Dervishes, and Kinetic Cascades—the exhibition explores the philosophical depth and intellectual aspirations of geometric abstraction, which have, at times, spiritual overtones. Certainly, the graceful and fluid mandala-like linear abstractions by Argentine painter Eduardo Mac Entyre bear an unapologetic relationship to spiritualism. And the reductive compositions of colorful hard-edge geometric shapes in works by artists such as Hélio Oiticica (Brazil), Freddy Rodríguez (Dominican Republic) and Omar Rayo (Colombia), among others, suggest a higher, meditative purpose. “The Illusive Eye” is full of whimsy, and the show is an unabashed visual delight. But in a new context, in our present troubled era of the 21st century, new implications and a profound undercurrent become discernable in these works. Since the dawn of civilization, artists have been experimenting with illusionistic devices meant to trick the eye. But perhaps only with the greatest intellectual and technological advances can this illusionism serve to soothe the soul.